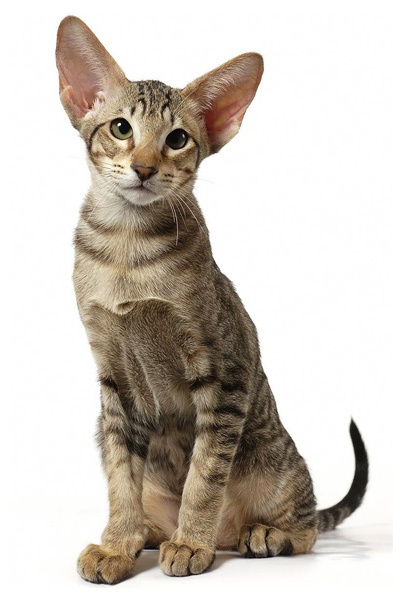 The Serengeti cat is a medium-sized feline that was first bred in 1994 by crossing a Bengal and an Oriental Shorthair. Although considered a domestic breed, we put the Serengeti in our hybrid category because of its Bengal blood. The Serengeti was bred to resemble a Serval. Its athletic build and long sleek body contribute more to his exotic look. With the longest legs of any domesticated breed, the Serengeti can jump up to 7 feet in the air. The Serengeti is a friendly cat, but that’s not to say it is one of the most easiest breeds to parent. It’s just not the Serengeti’s style to immediately warm up to humans and other pets the moment he meets them. You have to earn this breeds love by taking things slow and giving it time to warm up to you. It usually takes a day or two for a Serengeti to start establishing a relationship with humans and other animals. But, don’t worry, once the bond is established, you may be surprised at how responsive and outgoing this cat really is. This breed has even earned the nickname “Velcro cat” for it’s tendency to stick close to its’ human’s side, following him or her around and nosing in on anything he or she might want to do around the house. The Serengeti is very vocal breed of cat. When something catches his attention he won’t hesitate to share his thoughts with a few loud meows and purrs. This cat can also be very friendly with kids as well. Just remember to check in on the little ones, because sudden bursts of energy such as zipping back and forth and pouncing might startle kids. The Serengeti is a wild looking lean and muscular medium-sized cat that usually weighs between 8 – 12 lbs. They have a short, fine coat that is smooth to the touch. Long legs and neck with small oval paws add to the Serengeti’s regal and elegant appearance. Creating a more wildcat-like appearance are this cats ears; which are wide at the base and flare out at the tips. The Serengeti cat was first bred in the early 1990’s by avid cat fancier and conservation biologist Karen Sausman, who is now the owner of Kingsmark Cattery in California. her goal was to create a wild-looking cat with domestic parents. Aiming for the look of a Serval, Karen’s breeding program crossed the Bengal (a hybrid cat) and the Oriental Shorthair (a domestic cat known for its exotic looks. Since then, The International Cat Association (TICA) and are granted the preliminary new breed status in their roster. 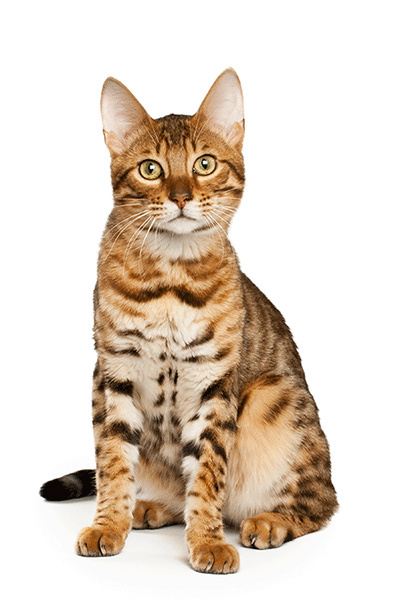 The Serengeti is a generally healthy breed, however it does is know to have a few health issues including the risk of urinary calculi, or crystals which can form inside the cats kidneys or bladder. Make sure to talk to your vet about recommended diet for this breed of cat. This breed is easy to care for when it comes to grooming, only requiring a good brushing every once in a while. Make sure you have enough time and attention to give this cat as its need for social interaction is relatively high. $600 – $2000 depending on the breeder, age and quality of the cat.